Back to Your Sparkling Event, LLC. 15 Reviews for Your Sparkling Event, LLC. My daughters wedding would not have happened without them. Your Sparkling Event is the best event planner, they will handle all of your needs and exceed your expectations. My daughters wedding would not have happened without them. Their attention to detail, made it all happen. Their level of service and personal attention is like no other. Jenna and Kim are the best, and we can never thank them enough for all of their assistance. They are part of our family now and we love them. Look no further than Your Sparkling Event for any future events. My now-wife, Ashley Post, and I recently worked with Jenna Wittbold, owner of Your Sparkling Event for help in planning our wedding. Originally I had thought that my fiance and I could tackle the planning and execution of creating a dream wedding on our own. We very quickly learned the amount of time, money, research, organization and STRESS that goes into trying to plan your own wedding. I reached out to Jenna and after speaking with her on the phone and meeting in person, we immediately recognized her value which came through her knowledge & experience of wedding/event planning, Jenna's ability to leverage her extensive network of vendors & contacts, and her willingness to listen to & understand our wants/needs/expectations. 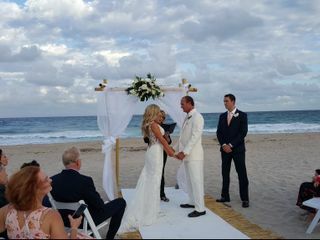 The best decision I made... of course, 2nd to marrying Ashley, was retaining Jenna with Your Sparkling Event's services. Jenna quarterbacked our entire wedding planning process. She was involved in every step: touring different venues until we found the right one, guidance with the bride/groom/wedding party attire, photography, videography, DJ, floral, save-the-dates/invites, food/appetizers/hor d'oeuvres/bar, rehearsal dinner planning... you name it! My wife Ashley and I really only got as involved as we wanted & needed to be. 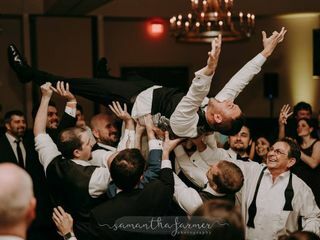 When the day finally came, 1/19/2019, my bride Ashley and I felt calm & confident, knowing that we could enjoy our wedding day and expect it to go "as planned", because of our partnership with Jenna of Your Sparkling Event. Jenna and the Your Sparkling Event team, we cannot thank you enough for creating our DREAM WEDDING! There is absolutely NO WAY we could have pulled it off without you. Your professionalism, attentiveness, industry knowledge/experience and resourcefulness were evident throughout our time working with you. If we could give Your Sparkling Event a 6 star review, we would have! 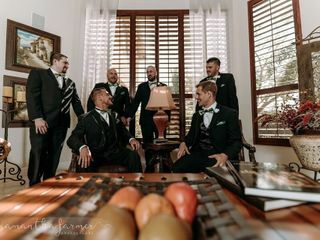 Jenna and team... On behalf of Ashley, myself and the entire Post/Grupp family, we will be forever grateful for you for planning us the BEST WEDDING IMAGINABLE! We have received so many gifts through this wedding journey I can hardly name them all. Just two months ago , I could never have imagined that we would be standing on this side of Feburary 18th feeling so happy and gratified on the flawless outcome . Every second of this pleasure we owe to you and your staff at Your Sparkling Event. Jenna you are a maker of dreams ,interpreter of visions and owner of a special wand that sprinkles magic over everything. You know when things are "a perfect fit" and know the meaning of " just right". You start with a better idea of what that looks like and transform it into what was our dream all along. We could not be more pleased. Thank you for coming to our rescue so many times. I never got tired of the follow up phone call " I'm just calling to make sure that you are ok."
You did everything we asked for and things we only dared to ask for always with a smile on your face and a breezy demeanor. When the wedding day came, the entire day was all under control nice and smooth. My wishes for a stress free wedding and the dream wedding for my daughter were realized. The last unexpected gift was getting to know you personally. You are a beautiful ,thoughtful woman with an enormous heart. Thank you for all the fun and special moments! My husband and I booked Jenna for our September beach wedding and it was the best wedding decision we made. Initially, we didn't think we needed a planner or a coordinator, but as time passed we soon realized it was totally necessary. I looked into tons of different coordinators and planning companies and was unsure where to start. My photographer had worked with Jenna on weddings in the past and said that she was simply amazing. From the first time that I spoke with her, I was 100% confident that we were in good hands. She went aboslutely above and beyond anything we would have expected!! My husband and I just kept saying to each other "she is amazing; I don't know what we would have done without her". This is the best wedding investment we made and I couldn't imagine our wedding day without her. Everyone kept telling me that something is bound to go wrong with how much last minute planning my husband and I did, but EVERYTHING was absolutely PERFECT and we owe it all to our amazing vendors, but especially Jenna. Everything was set up perfectly (better than I would have ever imagined), everything ran smoothly, her timeline and managing of all our vendors was amazing, and she even went and picked up donuts that we ordered from Jupiter Donut Factory for a donut tower on the morning of our wedding! If anything did go wrong on our wedding day, we weren't aware of it which is exactly how it should be. 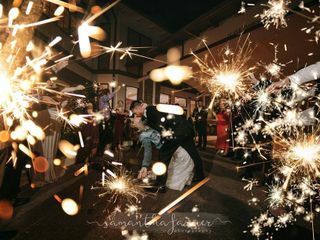 I would highly recommend Your Sparkling Event for your wedding or event! 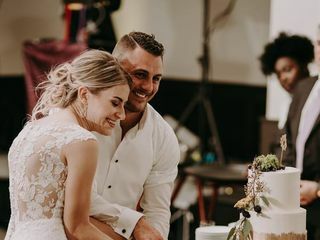 My daughter's wedding was two days ago and I know I would not have made it to the wedding had I been forced to deal with all the vendors and things that Jenna Smith had to do prior to and after the wedding reception. When we returned to our hotel room that night, the flowers and all the gifts, etc were already in the room. Ms. Smith is extremely professional and knowledgeable in every aspect of wedding planning...answering every text and phone call we presented her with those hairy last few days. We were able to walk into a wonderland ballroom without worrying if the vendors had shown up or if every detailed request had been done . Jenna saw to it that everything was in order and that all ran smoothly. Jenna presented everyone with a timeline for the wedding day so no one had an excuse for not being at the right place at the right time. This lovely young lady knows her stuff and we would highly recommend your Sparkling Event. 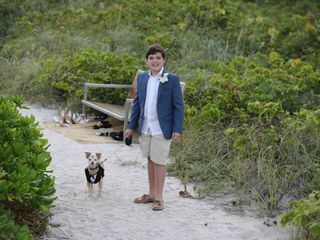 My spouse and I are from Michigan and we wanted a Florida wedding. I began to plan the wedding on my own and quickly realized what a huge undertaking it was. Jenna was kind enough to meet with us in a Sunday night to discuss our wedding. She provided an invaluable list of vendors she's worked with in the past. I ended up selecting my dress, cake, flowers and table/linens from the list. Leading up to the wedding anytime I had questions she answered immediately. The week prior to the wedding she took care of ensuring all the details and logistics were taken care of. I didn't have to make one single phone call to a vendor....she took care of everything! The day of the event Jenna and her assistant made certain everything was perfect! Right down to placing the rose petals perfectly on the cake table! She took my vision of what I wanted and turned it into reality!! FIVE STARS all the way for Your Sparling Event! From my very first meeting with Jenna Smith until the day of my wedding she was enjoyable to work with, creative, full of great suggestions and very willing to listen. Regardless of the size of the event there are so many details to take care of and Jenna took care of everything for me. I used many of the vendors that she recommended and they will all excellent. She made it fun despite times of stress on my part. The day of my wedding Jenna and her team were helpful, kind, efficient and caring to me and all my guests. I received many compliments about how wonderful the wedding was and that was all due to Jenna and her team. Bravo! Your Sparkling Event ~ job well done! Jenna was amazing! She helped us figure out everything we needed to do, helped us find vendors, came to meetings with vendors and developed a schedule with everything we needed to do which was updated frequently. We had no idea about so many things and Jenna was the perfect guide. She got to really know us and our style and made the wedding amazing and beautiful. 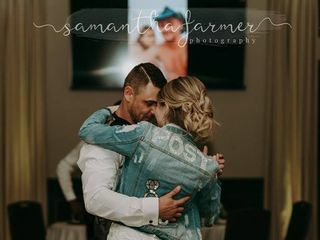 We are so grateful to have found her- it's difficult to find people who are good at what they do and are kind hearted, and Jenna was everything we needed and wished for from a wedding planner. We couldn't have done it without her, she's fabulous!!! Jenna is amazing! I was not the type of bride that had a lot of ideas about what I wanted my wedding to be like. Seriously, I had no idea what I was doing. Additionally, my husband and I have busy jobs and did not have much time to plan anything. We contracted Jenna for full wedding coordination services. She handled everything. She negotiated every contract, found us great vendors and was very flexible (often meeting us on weekends). The day of the event, everything was perfect. I think the best thing about Jenna is how comfortable it was to work with her. We spoke to other wedding planners and were put off by their sense of importance. Jenna is extremely professional while being relatable. Whenever a problem occurs she handles it right away without stressing you out. It really made the planning process fun for me. Lastly, I know that wedding planners can be expensive but I feel like Jenna ended up saving us a lot of money. We had a budget and she made us stick to it. She spoke with all the vendors, told them what we could afford, and she got them to come to our number. Even though I am a lawyer, I would not have felt comfortable doing that on my own because I do not know anything about the industry. She was also up-front about things we needed (lighting) versus things we did not need (draping). We definitely would have been over-budget without her. I cannot tell you the amount of times me, my husband and my parents said "I don't know what we would have done without Jenna." You won't regret hiring her and her team to help. Very professional, dedicated and hard working! Everything was PERFECT and I was 100% satisfied with my wedding and the flow of everything. I was grateful to have you and at a good price! Our wedding planner Jenna Smith was a true professional. She helped us with every step. We had several things go wrong due to the hotels poor service and not one of our guests noticed because Jenna was able to fix things immediately. For example we had 150 guests and the hotel provided only 1 bartender and 4 servers. It was a nightmare, they claimed 4 people called in sick...but they didn't do anything to fix the problem. Jenna rolled up her sleeves and started pouring drinks, bussing tables, and serving dishes. She was amazing. Jenna ran to Men's wearhousebecause a groomsman had the wrong vest, picked up a garter because I forgot to buy one, re-printed our programs due to an error ALL THE MORNING OF OUR WEDDING. I highly recommend Your Sparkling Event you will recieve the best service and won't have to stress on your big day! This was the best decision we made to have their services for my Big Day! Jenna Smith is phenomenal and so talented! I had no worries with her skills and clever techniques in making my big day more beautiful and stress free than I expected! She was absolutely perfect! Don't worry anymore just call them and you won't regret it!! Your Sparkling Event provided "day of" services for my daughter's wedding and was wonderful. Jenna and her assistant, Susie, were very attentive to us all but especially to the bride. Katie's every need was fulfilled before she knew she needed it! In fact, Katie told me that hiring Jenna was the best thing I could have done to make the day perfect! Jenna continued to tell me not to worry. It should have been a red flag. I explained to Jenna that one part of my ceremony was more important than anything else that day. I wanted a music video played before my husband and I walked down the isle. I had not only written out in detail how the ceremony should evolve - I drew pictures which I handed out to everyone. My husband realized Jenna had the screen raised and had not played the video. He again told her how important it was to me. She did not do the video. I also told her that I wanted my ushers to stand in the area leading to the theater where the wedding was taking place to direct our guests. She told me that she wouldn't do it. I told her 3 times that I wanted the ushers to do their job. She said she wouldn't do it. There were other things that were not as I wrote out and planned- isle runner down before it was supposed to be, etc., but it didn't matter. There was only one thing that was important and she screwed it up. She was only hired for day of wedding (which she kept repeating). Tables were arranged and set well. All items were placed as they should have been. I believe that Jenna did a professional job with everything else, but when something is important to you and you will never have another chance to make that moment happen again - it is devastating. When I said to Jenna that the song played at the wrong time and said the video did not play, she said "we'll talk about it later. Don't worry about anything." When I sent her an email after the event addressing my concerns, she said she was sorry I felt that way. She never apologized or gave me a reason why she didn't do it. Had she said I am sorry or that she goofed up, I would have understood. When you act like it just didn't matter - you are not doing a professional job. She told me it did matter, but, in my book, actions speak louder than words.